It all started when, Kristin, the mom of a grad sent a message that left us teary eyed, “I just received my order and I have sat at my desk crying for 10 minutes because my daughter’s graduation invitations are so beautiful and perfect.” With that comment we just had to know more about her daughter and what kind of party she was planning so we reached out to see if she would like to be one of our Featured Favorites. She gladly accepted and we featured her daughter’s graduation announcement along with her story. After talking further with Kristin, we asked if she would share photos from her daughter’s graduation party, and again she gladly accepted :). 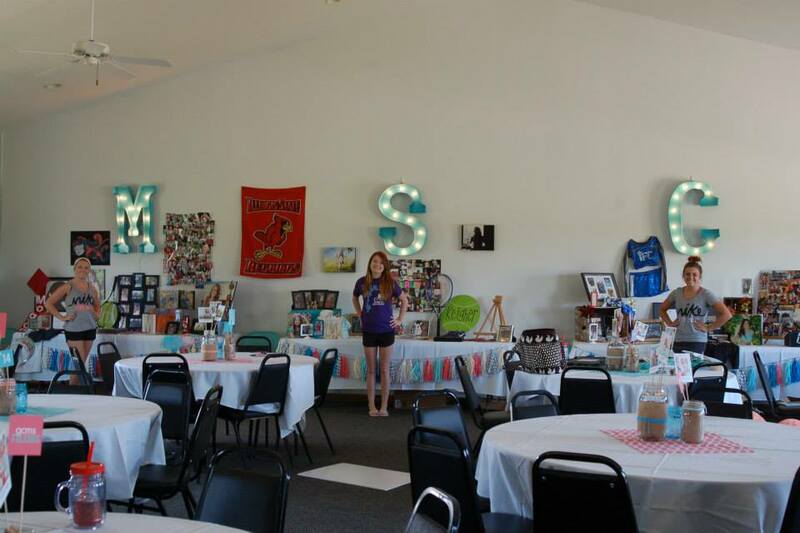 Kristin sent us the graduation party photos saying, “It was a HUGE success and the talk of the town!” We are excited to share her graduation party ideas with you! Morgan had a joint graduation party with her two friends. 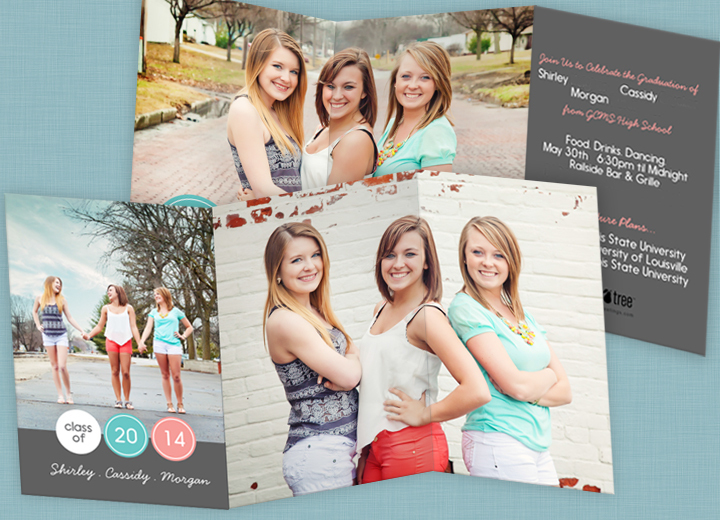 They took photos of the three girls and chose to use our Trifold Dots Graduation Invitation. They coordinated the colors in the invitation to match their clothing. What beautiful seniors! 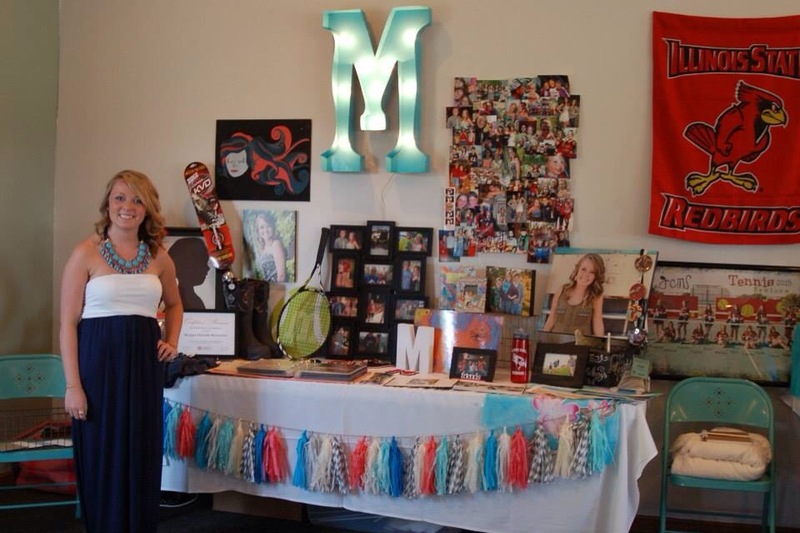 Each grad had their own table, set up with her personal accomplishments and photos. We loved the light-up initials! On the tables they had mason jars as the centerpieces. 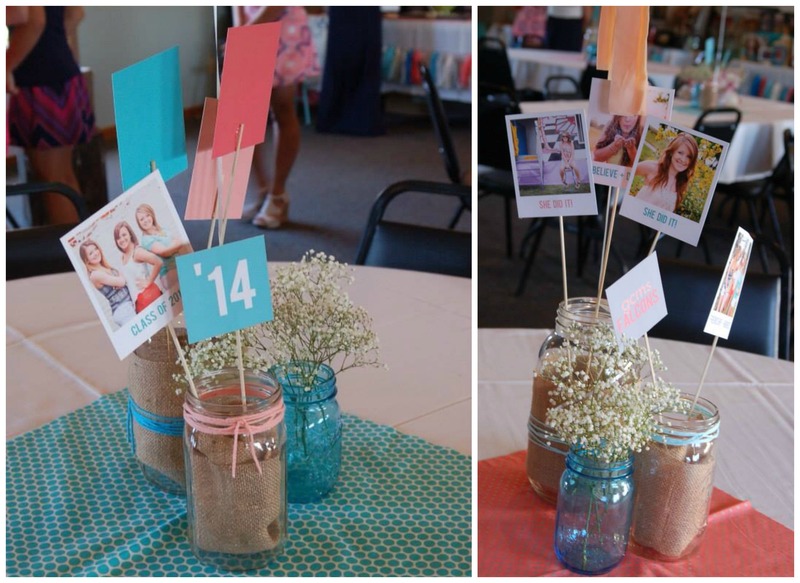 They put fabric inside the jars and used sticks to attach their Snapshot Photo Table Decor Graduation Party Decorations, personalized with photos of the girls and future plans. To top off the centerpieces, they tied a big balloon to each mason jar that floated above each table, and tied tassels made of fabrics matching the party colors along the string. We love how this creative idea added more color to the room. 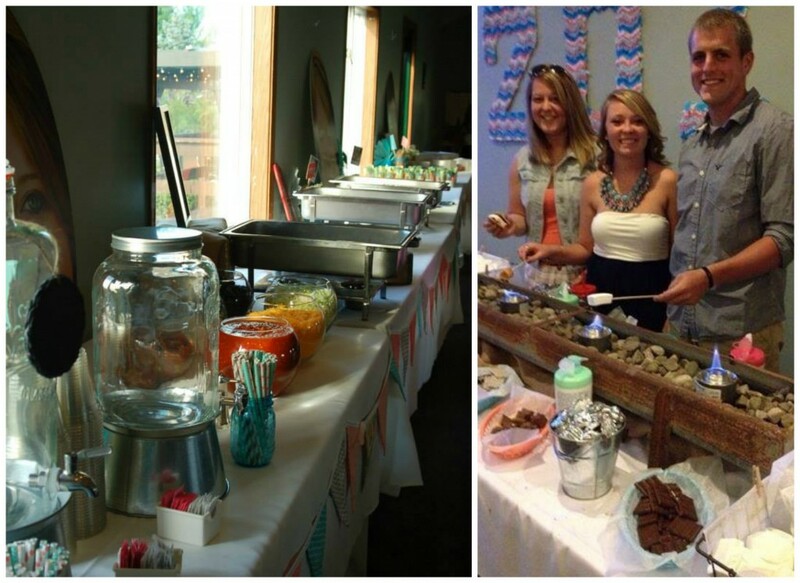 “Our s’mores bar and walking taco stand were hits!” shared Morgan’s mom. The s’mores bar is a unique idea, both fun and delicious! And for the final touches, the girls set out their cupcakes in the shape of ‘2014’ for friends and family to enjoy. A DJ was hired to get everyone on the dance floor and celebrate the girls’ accomplishments. “The girls had a great time!” Kristin added. Great job and congratulations Morgan, Shirley and Cassidy! And thank you so much, Kristin, for allowing us to be part of your daughter’s special day! 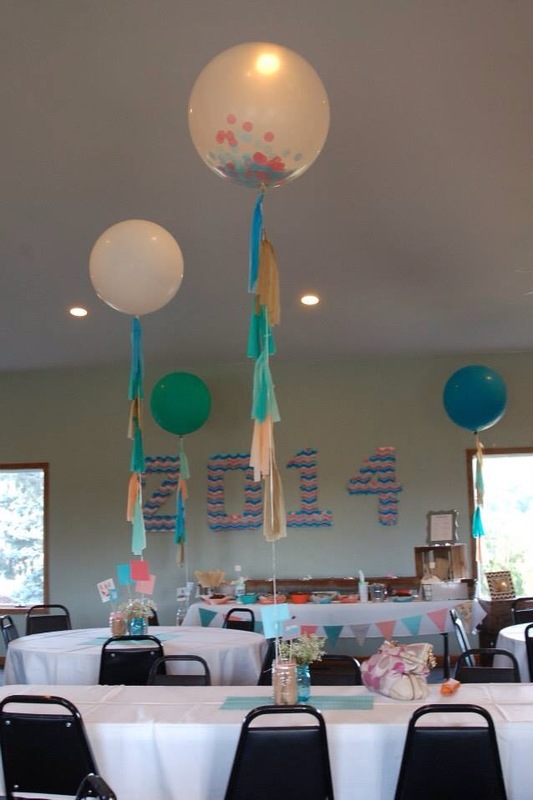 For more graduation party ideas, keep reading our blog or start shopping for your graduation party decorations to create a theme like these girls! I really love the cupcakes arranged in 2014. It looks like the cupcakes are on some kind of stand. Can you tell me what kind of stand? Thanks in advance. Hi Tammy, great question! This is a little bit of DIY, but if you cut out the numbers from cardboard, spray paint it the color you want and then underneath add wedges to stand the numbers to the height you want it to be. It is such a fun idea!! Hope that helps – thank you!! 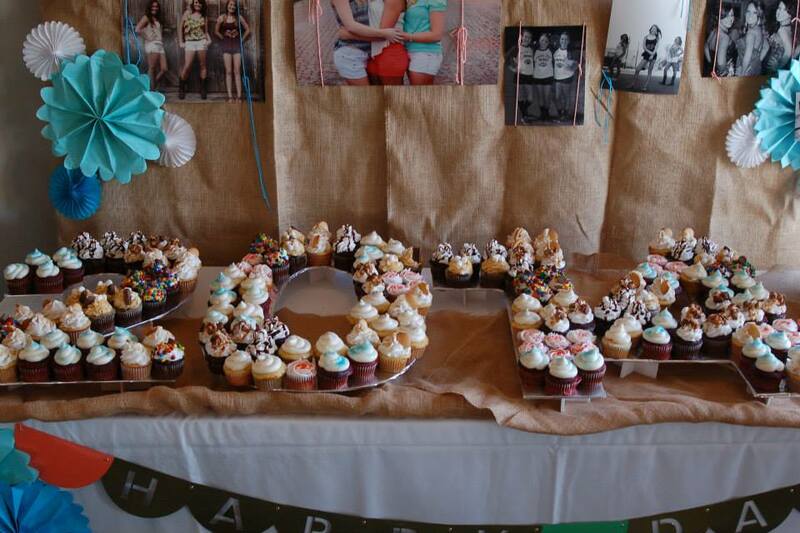 I also love the 2014 numbers for the cupcakes too – any idea the measurements of the numbers? Thanks in advance!! Hi Linda – glad you like these 2014 numbers! Great question, these numbers are about 2-2.5 feet long. You can go bigger or smaller depending on how much room you have and how many cupcakes you want displayed. Let us know if you have any questions – thank you!! How did you make the awesome light up initials? Hi Tammy, great question. You could find them on Etsy or a Amazon search for “lighted letters”. Hope that helps 🙂 Best of luck planning!! Love the cupcake stand and I would like to use it. How many cupcakes did you use? Also, how did you cut the numbers and what was the approximate cost? Hi Dawn, that’s great! It’s such a fun idea. This stand took about 180 cupcakes, but you can display more or less cupcakes depending on the number of guests that are planning to attend. Creating the numbers is a bit DIY: cut out the numbers from cardboard, spray paint it the color you want and then underneath the numbers, add wedges to stand the numbers to the height you want it to be. The cost is very affordable – just find old boxes to use and you can create the wedges or buy at the local hardware store. Have fun & enjoy the party!! I am totally doing a “2017” cupcake stand for my son’s grad party:) Did you put talker wedges in the back so the cupcakes are at an incline? How did you get the number shapes so perfect? i have been trying to find where to purchase the wedges, I am striking out is there a certain name for them so I can look it up by that?